Abstract: Endovascular technologies are rapidly evolving, often requiring coordination and cooperation between clinicians and technicians from diverse specialties. These multidisciplinary interactions lead to challenges that are reflected in the high rate of errors occurring during endovascular procedures. Endovascular virtual reality (VR) simulation has evolved from simple benchtop devices to full physic simulators with advanced haptics and dynamic imaging and physiological controls. The latest developments in this field include the use of fully immersive simulated hybrid angiosuites to train whole endovascular teams in crisis resource management and novel technologies that enable practitioners to build VR simulations based on patient-specific anatomy. 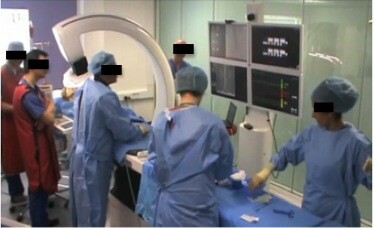 As our understanding of the skills, both technical and nontechnical, required for optimal endovascular performance improves, the requisite tools for objective assessment of these skills are being developed and will further enable the use of VR simulation in the training and assessment of endovascular interventionalists and their entire teams. Simulation training that allows deliberate practice without danger to patients may be key to bridging the gap between new endovascular technology and improved patient outcomes.